The Delaware Canal is the only remaining continuously intact canal of the great towpath canal building era of the early and mid-19th century. 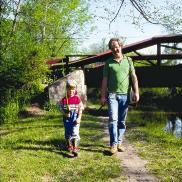 Mule- drawn canal boat rides and the Lock Tender’s House Visitor Center are at New Hope. Paralleling the Delaware River between Easton and Bristol, this diverse park contains a historic canal and towpath, many miles of river shoreline and 11 river islands. From riverside to farm fields to historic towns, visitors to Delaware Canal State Park will enjoy the ever-changing scenery along its corridor.